#OurNHS is ordinary for being staffed by #extraordinary people. Thousands of these people are immigrants. One of these people read the following statement to South Gloucestershire Full Council meeting held at Kingswood Civic Centre on 15th February 2017. Our blog reprints it below. My name is Margaret Woodward. I’m an immigrant National Health Service midwife, living, working and paying taxes in England since 1969. Resident in Kingswood, Bristol, since 1986. I want to speak about the impending storm which is threatening the NHS and which will also impact on local government. National government is about to impose another massive reorganisation of health and social care. You may have missed the Health and Social Care Act of 2012. That major top down reorganisation that came immediately after David Cameron promised that ‘there will be no more top down reorganisation’! That Act introduced marketisation and privatisation of health and in so doing increased costs.Every contract has to be put out to tender, competing with private companies whose duty is to make a profit for their shareholders. The current financial crisis in the NHS can be traced to government underfunding, fragmention and privatisation. U.K. has fewer beds, fewer doctors, fewer nurses per head of population than any European country. So enter Sustainability and Transformation Plans. A massive top down reorganisation by another name. … or Slash, Trash and Privatise healthcare. 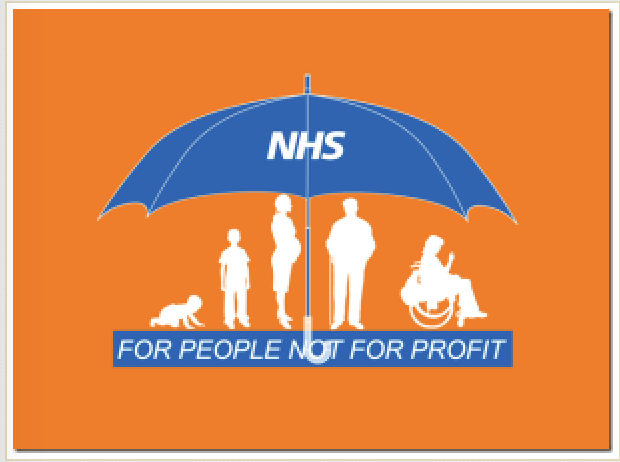 … Or financial cuts clothed in secrecy, which will compromise the core NHS principles. Why does this matter to you here at South Gloucestershire Council? STPs divide England into 44 ‘Footprints’. Our local footprint will be Bristol, North Somerset and South Gloucestershire. Its STP was published November 21st 2016. 340 pages! In the glossy booklet produced for public consumption it has lofty key principles, with none of the ideas backed by any funding for implementation. Instead, we know that £305million compulsory ‘efficiency savings’ i.e. cuts, will be enforced in BNSSG over the next five years. Each division in my trust has been told we will be financially penalised if we don’t make these savings! As a hospital based healthcare worker I know we have been making ‘efficiency savings’, especially over the last decade, to the point where we cannot cut any more. We struggle daily to find beds for those in need. But, it’s alright, Jeremy Hunt says as 30% of those people can be cared for at home! This is where the local council comes in. By devolving increasing responsibility to local authorities the government is shifting blame from itself to local councils. NHS England states that STPs must be supported by local government. Therefore this council has a right to campaign to safeguard local services. Well, I’m asking you all here to read the full STP for BNSSG and tell central government you will not be party to these unsustainable financial cuts which will destroy our NHS. Bristol City Council recently voted overwhelmingly to resist the NHS cutbacks and so did several other councils throughout the country. I urge you to do likewise. « January blues about the #NHScrisis? Keep the fight going!